If you’ve never tried acupuncture before, it’s common to have some questions about it. To help you feel more comfortable considering acupuncture services at the George Wellbeing Center in the Dayton at Gaviidae YMCA, Ray Himmelman, a Licensed Acupuncturist breaks down the basics. It uses needles in pressure points to move energy through your body. A treatment plan at the George Wellbeing Center focuses on holistic healing—meaning your whole body is considered. In addition to acupuncture, a treatment plan might include other elements from Chinese medicine, including herbal formulas or qi gong (system of coordinated body posture and movement, breathing, and meditation). A treatment plan might also include stretches or dietary recommendations. Acupuncture is generally a pain-free experience. You might feel sensations like tingling during acupuncture. The needles are thin, flexible, gentle, made of surgical steel, sterile and are only ever used once. You can expect your acupuncturist at the George Wellbeing Center to open the needles and dispose of them in front of you, during your session. Needles used during an acupuncture session might be placed on various parts of your body—not just the area where you have an issue or concern. All acupuncturists at the George Wellbeing Center are licensed by the State of Minnesota, certified nationally, and have either a master’s or doctorate degree. Learn more about what to expect with acupuncture services. Even if you don’t have a specific issue in mind, you can benefit from acupuncture as preventative care. 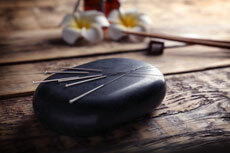 Group acupuncture services can be an economical way to give acupuncture a try if you are interested. Group acupuncture at the George Wellbeing Center includes members of a group arriving at staggered times, talking individually with a practitioner about wellness goals, receiving needles, and then resting with the needles in a group setting. Visit the George Wellbeing Center for a free 10-minute acupuncture consultation to ask any questions you might have, and learn more about how it might help you.